You Might Heard Of Carbonite, Are They Good? Carbonite Review – You Might Heard Of Them, Are They Good? Overall : 3.8/5 – Recommended! Who Is Carbonite? Are They Really Good Enough? Yes. Carbonite does live to their reputation. Carbonite founded in Boston with over 400+ employee to date. Since founded on 2005, which is quite pioneer during that time. Carbonite has backup more than 200 billion files and this is a great achievement and responsibility for the provider. Carbonite core and only business is the online-backup. They did extremely well for that. They are 100% focused in safe guarding your data and files. Maybe that’s why they do not have the sync function, drag & drop and online editing function. Their main purpose is to backup your files in a simple and hassle free way. Try Carbonite Computer Backup free for 15 days, No cc required! 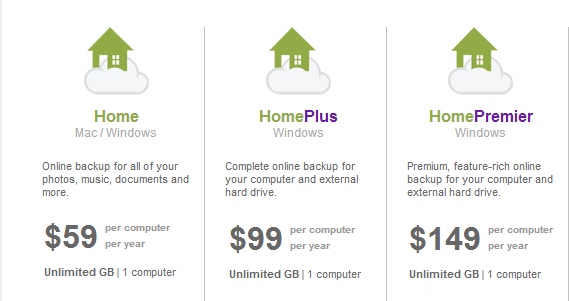 HomePlus from Carbonite has unlimited backup storage. You can backup and store as many gigabytes of data & files as you wish. There’s basically no limit but a few points that I think you should know in hand. I had put them in point form. There’s an upload bandwidth cap for 200GB and onwards. It means that your backup will become slow when your backup has reached 200GB and above. You have to manually backup all the video file except for the HomePremier plan. All the plans are limit to 1 computer. Other than that, Carbonite has been a very user friendly service. Everything runs automatically, unless you set them to manual backup. Every file that has been backup will have a green dot. An orange dot mean the file have not been backup yet. A right click on the particular file will indicate the status of the backup. Here is a screen shot of mine for you to have a better understanding. Mirror Backup? Operating System Backup? Yup. You heard me right. 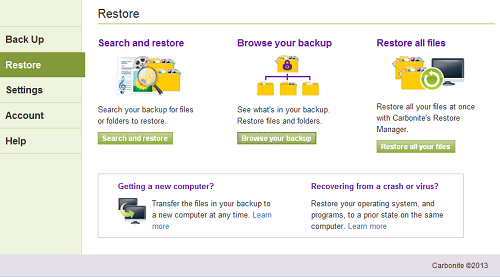 Carbonite actually backup your OS and all your installed software such as Microsoft Office, PDF and etc. They will create a mirror image of your entire computer, not just only the files and folder that you backup. For this, you can run back your computer to the state they are before they crash due to whatever reason. This is a very neat and awesome feature. In fact, I can’t see any other cloud storage provider that has the similar function. Did you know that they are the few backup service that provide Mirror backup? Carbonite is the only provider that has live chat function. This surely is an added bonus to consumer as they can get their problem solving on the spot if you don’t like phone support. The live chat is available 7 days a week from 8.30 am to 9 pm (Boston time). They also have a very large knowledge base and tutorial which is more than enough to answer all your problems if you are the type that like to dig information on own. Restoration has never been easier with Carbonite. If you deleted your file accidentally, don’t worry as you have 12 file versioning and they will keep it for 30 days. Restore your files and folder takes only a click away. What you need to do is to select the method of how you’re going to restore back, either by manual selection or restore everything. I’m Counting On Them, Is Carbonite Secure? 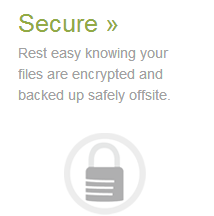 Carbonite only business is to backup your files & system securely. This is what they do best and the only thing they do. So, do you still doubt about their security and reliability? Your files are encrypted with 128 bit BlowFish cipher when still on your computer. Your files being transmit using 256 bit SSL technology. This is similar to the e-commerce and online banking. Enterprise grade server to store your files and system. Data center is heavily guarded 24/7, temperature control, UPS, CCTV and etc. Did you know there's more than 400 talented employee in Carbonite! Conclusion: Do I Recommend Carbonite? Yes, I do recommend Carbonite. They are the only cloud storage provider that has live chat and providing US-based support to customer. File restoring is very easy. The easiest in the industry in fact. US based support. Great extend of support from Phone, email, knowledge base, video tutorial and live chat. Pricing is cheap and affordable. Still not sure about Carbonite? Don’t worry on that. Get to try for free yourself. If you don’t like it, just leave it. Or alternatively, you can always opt for other best cloud storage recommendation from here. You can't be wrong when there's more than 200 billion files backup by them!